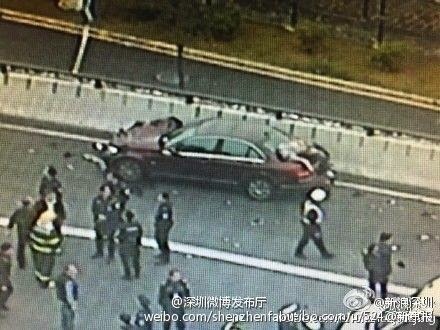 A single car accident at Shenzhen Bao'an International Airport in Shenzhen, China at 3 PM, has left nine people dead. The accident started when a woman driving red sedan ran over several pedestrians near Terminal 3 of the airport, killing 5 on the scene and 4 at the hospital, and also injuring 21 others. The 24-year-old driver said she lost control of her car after a car behind hers honking her multiple times demanding her to faster her car. She was nervous and losing control before hitting people who was watching plane take-off. Some victims were thrown from the platform to the ground. 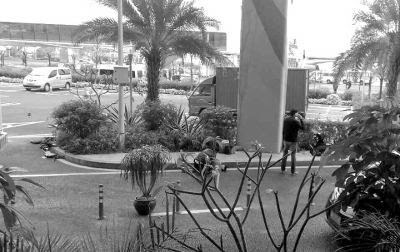 From a parking lot close to the accident, CCTV caught the moment when two people fell from the driveway. The airport officials said that the platform was not intended for pedestrians, meanwhile the accident survivor said that there was no sign of whatsoever banning pedestrian from the platform. The airport promised to add signs and increase patrols in the future. No response yet to "Men Falling from Airport Flyover after Hit by a Car"